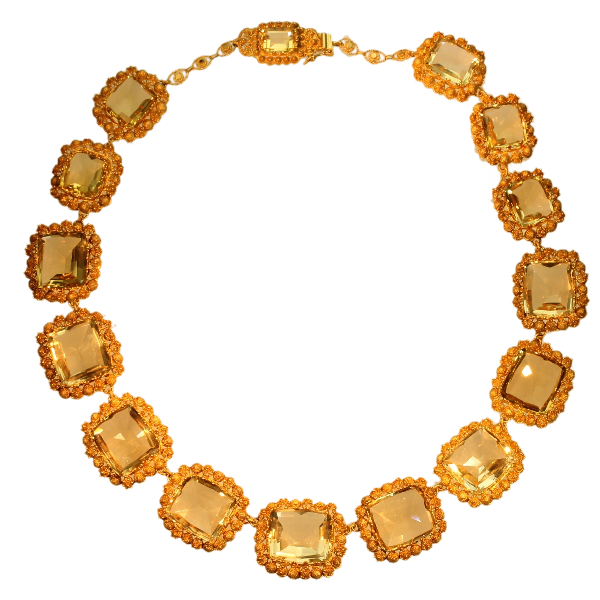 Antique necklace gold cannetille filigree work with 15 big citrine stones: Description by Adin Antique Jewelry. This fiery 18K yellow gold Georgian necklace of cannetille work folds around your neck as a gentle swirling summer breeze. Every of these 15 degrading rectangular cut citrines gleam out of their granule topped setting fused on a scintillating corona of filigree, entirely composed with tendrils, scrolls, granules and spirals. Although this delicate necklace looks as ethereal as lace, still how clear it is that it will never loose its glory and it will keep on outstanding the test of time. Country of origin: Although it does not carry any legible control marks we believe this to be of French origin. Style: Georgian - Georgian style is the name given in most English-speaking countries to the set of styles current between 1720 and 1840. It is eponymous for the first four British monarchs of the House of Hanover—George I of Great Britain, George II of Great Britain, George III of the United Kingdom, and George IV of the United Kingdom—who reigned in continuous succession from August 1714 to June 1830.
cannetille: This specific filigree technique, which is the technique of twisting or plaiting a thin gold wire into refined motifs, was popular in traditional Spanish and Portuguese jewellery. It became hugely popular in London and Paris in the 1830’s. Birthstones: Citrine is the birthstone (or month stone) for November. August - September - October - November or December. jewelry glossary - wall of fame - visit us in Antwerp - subscribe to our mailinglist. What is antique jewelry? - What is estate jewelry? - What is vintage jewelry?